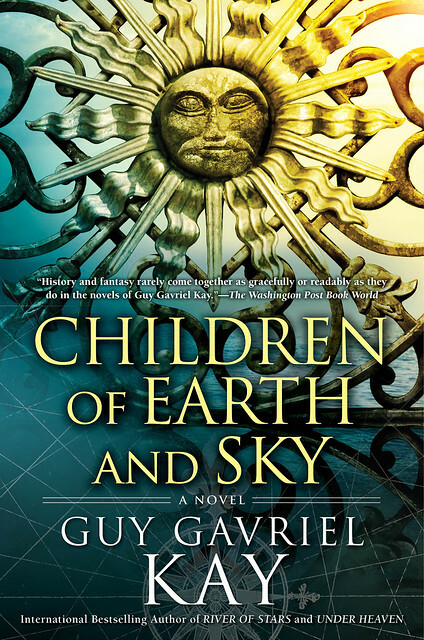 For today’s Big Idea, Guy Gavriel Kay is here to share a favorite passage from a writer of histories, and what that passage has to do with his latest novel, Children of Earth and Sky. So, the other key to Children coming together for me was a passage in a book. A great book. A monument of historical writing called The Mediterranean World In the Age of Philip II, by Fernand Braudel. I could write an essay on the greatness of Braudel, but I’ll let those intrigued google him (then read him!). I’ll say I first read this magisterial work when I was researching A Song For Arbonne 25 years ago, but it occurred to me that I might just possibly not have it entirely memorized, and a reread might be useful for the new book, mixed in with the books and articles I’d collected as I entered the research phase for Children. It wasn’t that this was a shocking new thought. It is a motif I’d even touched on before in books, but the awareness came hammering home that this – this! – was a part of what the new book was going to build itself around. I was already thinking about borderlands, lives lived there, the instability (often violently so) of where the borders were, the wars waged to change them, the decisions of the ‘great’ hugely impacting ordinary lives. What Braudel reminded me was that it went the other way, too! Men and women did not necessarily subscribe to the desires and ambitions of their leaders. They wanted to get on with their lives. Feed and shelter their children, cut enough firewood for the coming winter, build fences to protect the livestock, walls against raiders, trade with the so-called enemy (even ‘infidels’ at times) if it would help get food for those children. They wanted to arrange to marry their daughter to the son of the farmer next door (unless they hated the farmer next door). They were preoccupied by a laborer’s illness at the wrong time (harvest season! ), by an insult in the tavern, by fears for their own immortal soul. They thought about trade goods and desire and gossip and needing new oxen and the pleasures of a spring morning with the leaves coming. These ideas, these priorities in the lives of people locked in for me as core themes for the new book. I’d aim for a novel that touched upon, that even appeared generated by a massive conflict among powerful empires and states. But I’d use that as a backdrop, a framework, for a book that paid really close attention to how men and women sought (with varying success) to live and shape their own lives in such times, across such borders, during the wars. That’s what a single passage in Braudel brought back home to me, and what Children of Earth and Sky told me it wanted to be about, right then. That’s what I’ve tried to make it. The stories of the ‘great’ are not the only stories we have to tell. GGK is one of the best writers I’ve ever read, and it makes me jealous that I can’t write like him :). I devour anything he puts out, and have read them all many, many times. New GGK novel? Pardon me, I must do my happy dance now. Oooo. I love his books. I’ll need to add this to my list! I’ve loved Mr. Kay’s work for years. I even chose an excerpt from Tigana, my favorite novel, for a literary translation term paper. Imagine my surprise (and glee!) when I realized he was going to visit a local library on my birthday this year. Best birthday event ever! Fernand Braudel, A genius of historical processes. This book and his series (dare I call it that) Wheels of Commerce: Capitalism and Civilization, 15th – 18th century, informed my and many others thoughts on how history works. So happy to see a new work by Kay. Pleased to hear but not surprised to hear the amazing care he takes setting his works. I know that road…people really do drive too fast on it! Guy Gavriel Kay is one of the great fantasy writers of the past 100 decades or so. For me at least, he outranks both Tolkien and GRRM. Buy this book, and then buy all the rest of them. Looking forward to welcoming Guy home to Winnipeg this weekend as he does a reading and interview at McNally Robinson Books (which is within spitting distance practically of where he went to high school). Giving a story about the actions of the small a frame of the actions of the big reminds me of Ellis Peters’ Brother Cadfael mystery novels– they’re engrossing, and it’s a wonderful way to flesh out these “little” lives that seem so far away from our modern experience. Yep, +1 to GGK. I have quite a few of his books. Sailing to Sarantium is my favorite, but Ysabel is wonderous. Just pulled down a selection of GGK books from the top shelf of my bookcase for my niece to read, and then came here to find this Big Idea. Serendipity! Ooh, like everyone else I’m just so excited for a new GGK novel! Speaking of the little people and their priorities: While the series Babylon-5 was necessarily about the actions of the space station commander and his officers, one of the episodes was told entirely from the viewpoint of maintenance guys with tool belts. A charming idea. And now that I finished it… good book but not among his best. It felt choppy with the million different points of view. Liked it a bunch but didn’t love it. I didn’t particularly love River of Stars either, where I thought Under Heaven was superb. I was so excited about this book. GGK is one of my favourite authors ever, and a book set practically in neck of the woods, in places I’ve visited and loved many times? Bring it on! But then I read the sample and saw what Danica calls her grandfather. *sigh* This means something really unflattering in my language (spoken near the place where the story is happening). There is zero likelihood that someone would call a person they respect that. I can’t read that. I just can’t. How interesting. These are thoughts that have occurred to me, but it’s much more gratifying to read about them from the perspective of someone more practiced than me at historical analysis. I’m clearly going to have to add this book to my reading pile (and my review queue). It happens less and less in the genres I follow but at times you still come upon writers you have managed to miss out on for decades. What the author wrote interested me enough to Google him and his works but it’s the enthusiastic comments that convince me I may be about to find a new treasure trove of books. GGK’s Summer Tree trilogy still haunts me as one of the greatest series of books I’ve ever read. Seeing that he has a new about to be out makes me very, very happy. I’ll have to preorder it on my Kindle if it’s available there. To anyone who hasn’t read his works: You would be doing yourself a service to take some time and read anything by him. His Summer Tree books (the Fionavar Tapestry is the actual trilogy name) are still my favorite to this day.